Leiane Taylor shares her tips on how to get J.Lo perfect smokey eyes. Here are five muscle sculpting workouts to help you get toned in no time! Heed the advice of MELISSA CHRYS on how to survive the Christmas party season with style, panache and your dignity intact. Member 2,393 on the Hollywood Walk of Fame is a Greek American actor best know in Australia for his role as Uncle Jess in the American tv series, Full House. The latest movie produced by Greek film producer, Paris Latsis, was launched in New York. A documentary by Anna Giannotis which focuses on first and second generation Greek Americans living in southern California was premiered in Los Angeles last week. Compulsory paid paternity leave and a salary replacement income for parents could be the key to promoting gender equity, according to a leading feminist academic. Michael Poupouzas, who loves his Yiayia’s food and describes himself as ambitious, is our Young Greek of the Week. 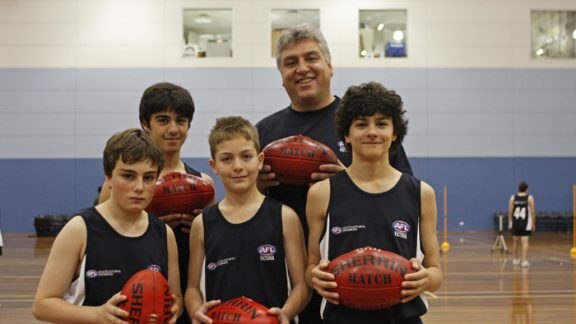 Nick Hatzoglou about the AFL’s Multicultural Program and its work in extending aussie rules to culturally diverse communities.